You’re either an oyster person or not. I am. Definitely. 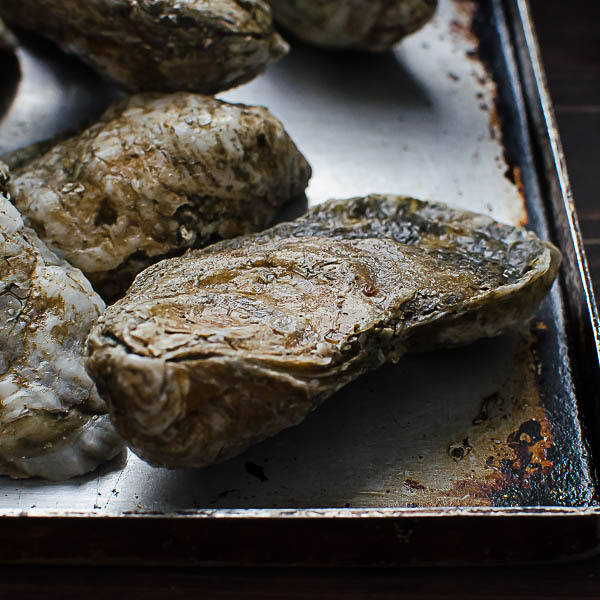 I grew up near the Chesapeake Bay and my paternal grandmother lives near Rappahannock — and the river where they harvest what I consider the best oysters on the East Coast. In fact, a few years ago Food and Wine did an article highlighting this hometown favorite and the fortitude of two cousins working to resurrect this delicacy. So when I received a UPS package two days before Christmas stamped “Rappahannock Oyster Company, ” I was doing my happy dance as I ripped into the box! I’ll start with a huge thank you to my grandmother, Myne and my Aunt Lynne and Uncle Buck for this fabulous holiday surprise! It was like getting a taste of home and we are so appreciative! Oysters in their shell are special. 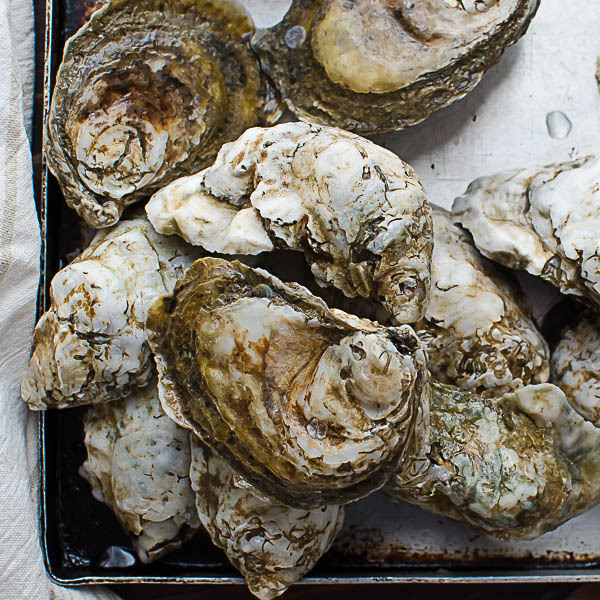 Rough and craggy on the outside with a smooth, shiny pearlescence on the interior, these bivalves don’t come with an easy close zipper or fancy packaging — they’re the real deal. Treat them with respect. 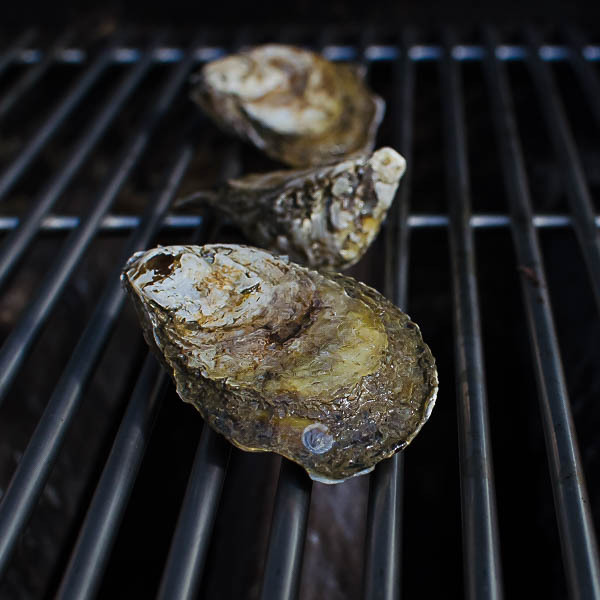 We love raw oysters on the half shell with a lively mignonette or nose-hair curling horseradish sauce but for these beauties, we opted to grill them instead. 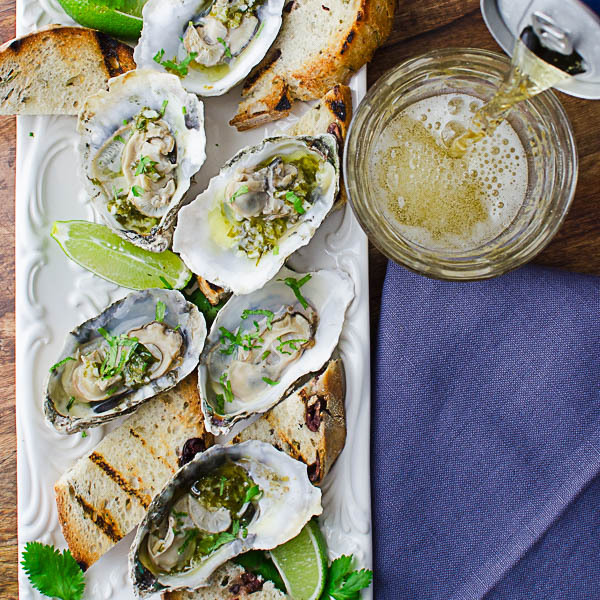 With a citrusy garlic-cilantro-butter sauce and rustic grilled toasts, these oysters are utterly sublime! They only take a few minutes on a hot grill and the sauce comes together quickly as well — and after all the prep and cooking from the holidays, we could use a quick, easy dish, right? I like a little heat with my oysters and for that (and to cut the buttery richness of the sauce) Crystal is my pick. It has a vinegary tang that’s very complimentary to this dish. 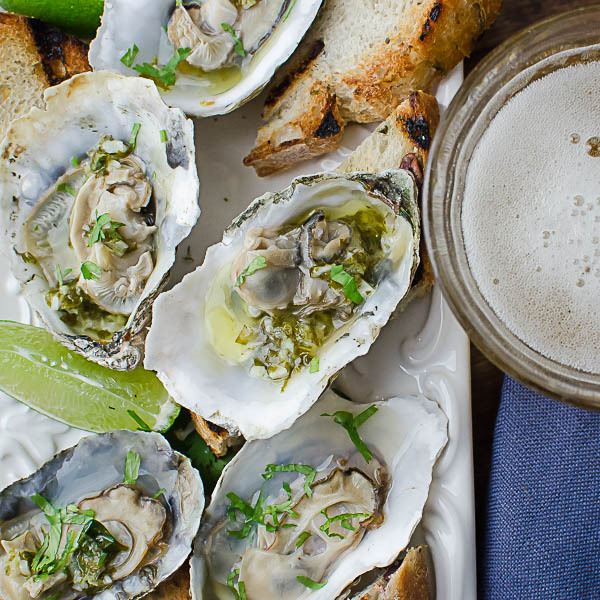 We cracked open some cold beer to serve with these bivalves, but if you’re planning this for New Year’s Eve, you might try a different bubbly. 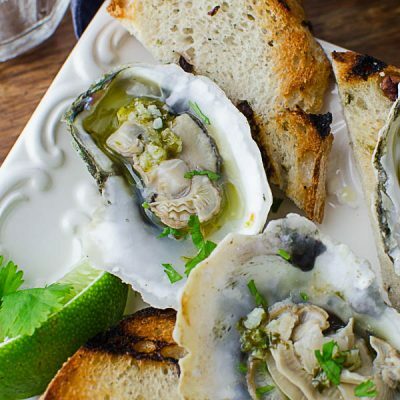 Tender, briny oysters grilled in their shells with a garlicky butter lime sauce and a dash of heat! Easy to make - and so freakin' good! 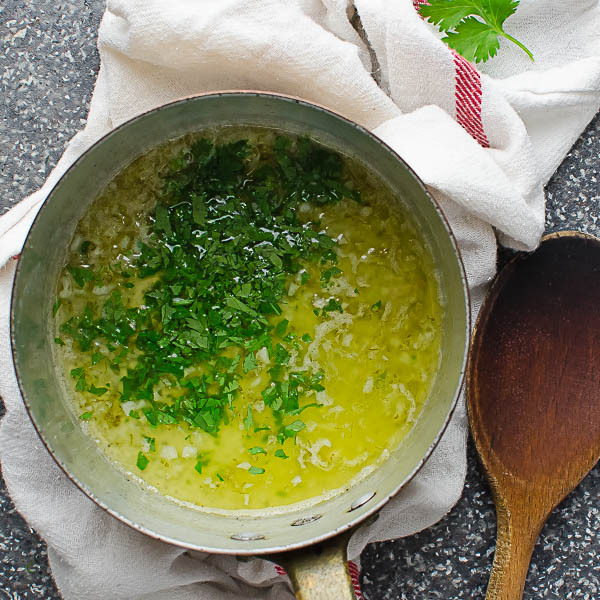 Melt the butter in a small saucepan over medium high heat and add the minced garlic. 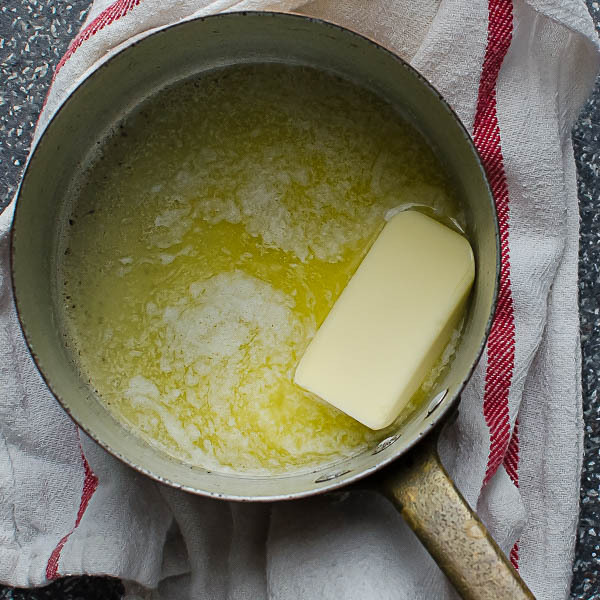 Cook for about 1-2 minutes so that the butter is fragrant. Add the lime zest, lime juice and cilantro. Stir and set aside. Brush the slices of bread with the olive oil. Grill the bread for 1-2 minutes per side until it starts to take on color and get crispy. Transfer the bread to a platter. Using an oyster shucker, slip the tip of the shucker into the opened crack in the oyster. Run the oyster shucker back to the hinge of the oyster and twist it to open. If the oyster is still attached to the muscle on the shell, run the shucker between the oyster and the muscle to detach, being careful not to spill any of the liquid. Discard the flat part of the shell. Arrange the oysters on a platter and spoon one teaspoon of the butter sauce over each oyster. Garnish with wedges of lime, chopped fresh cilantro and a few drops of your favorite hot sauce (we like Crystal). 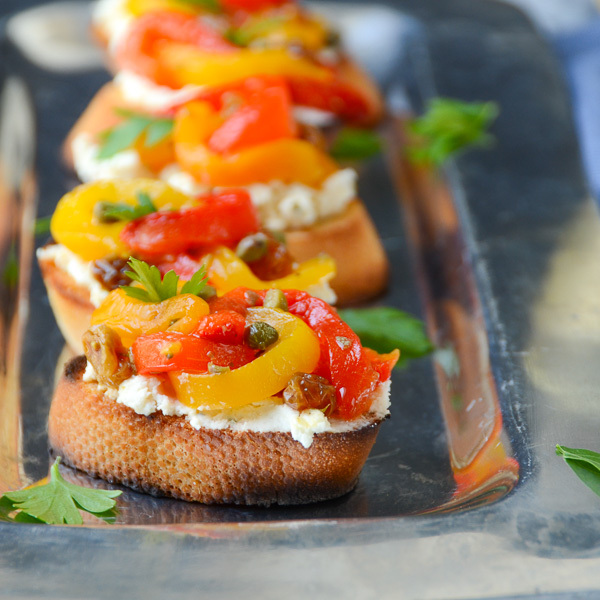 Serve with grilled bread. I SO wish I liked oysters, it’s been a few years since I tried them but the texture was just so wrong to me lol. My boyfriend loves them and I always think they look so good, maybe it’s time to try again! Grilling firms up the texture -if that was your issue. What a fresh twist for flavor. Grilled toasts sound perfect too. I’ve always been a bit iffy about oysters but I’ve never had them grilled like this, they look tasty! I understand the hesitation if you’re not used to them… if you’re not gonna eat them, can I have yours? I love oysters! And this is such a delicious take on them! Dear Lisa, These oysters are beautiful! What a gorgeous summer dish…I’d love to make this before summer ends for good! 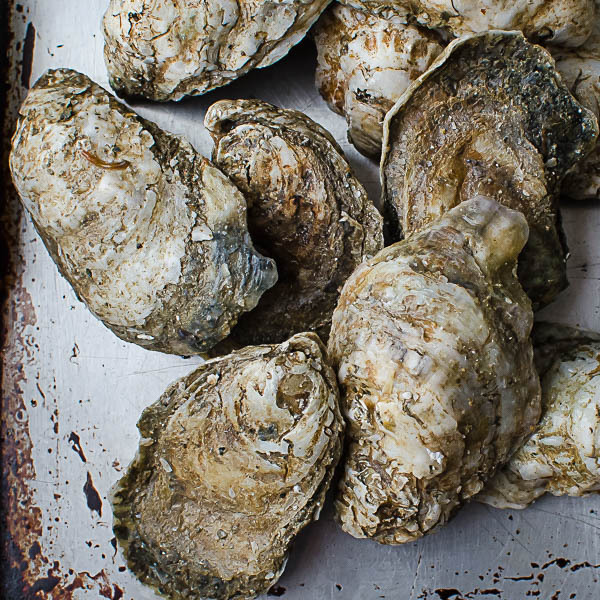 Actually, the best oysters you can get are in months with “R” in them — so we’re coming up on prime oyster eating! I am definitely an oyster person. I love them so much I’m always conniving ways to get them in my belly! Your oysters looks so delicious and I can’t wait to try them! A fellow oyster lover! Glad you like them, Elaine! Oh man, now I’m craving oyster! I rarely make it at home and usually go out for it but I might give this a try! Get the best oysters you can for this! What a great gift! 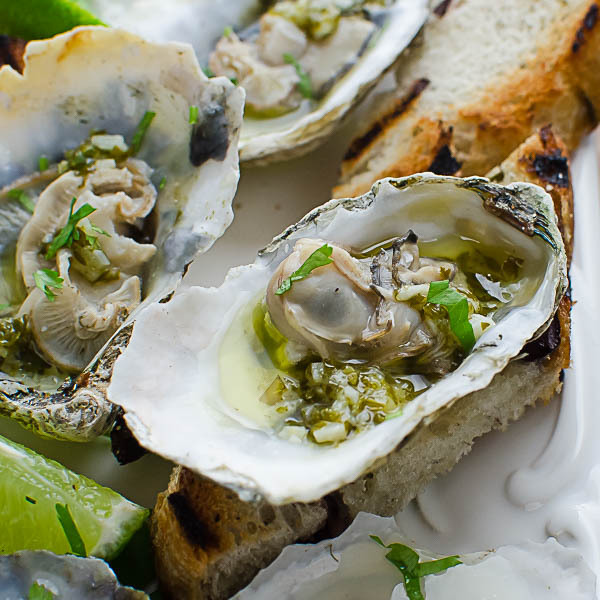 I love raw oysters with a nice bright mignonette–but grilling with these citrusy flavors sounds delightful! I was sopping up any extra butter and juices with the bread! Heaven! eeeekkk. Never tried oysters before. It’s one of those foods that I’m not very adventurous with. I’m a vegetarian, but that doesn’t mean I don’t enjoy watching people throw back a few of these and comment about how they taste ‘like the sea!’ – it’s a very romantic idea, isn’t it? Serving oysters…. and you, my dear Lisa, make it look SO easy! They do taste like the sea — and they are so easy, Tina! Pinch your nose and pretend it’s a carrot! This is one for my hubby; he would eat them all… no sharing whatsoever! I’ve gotten into wood grilled oysters lately. 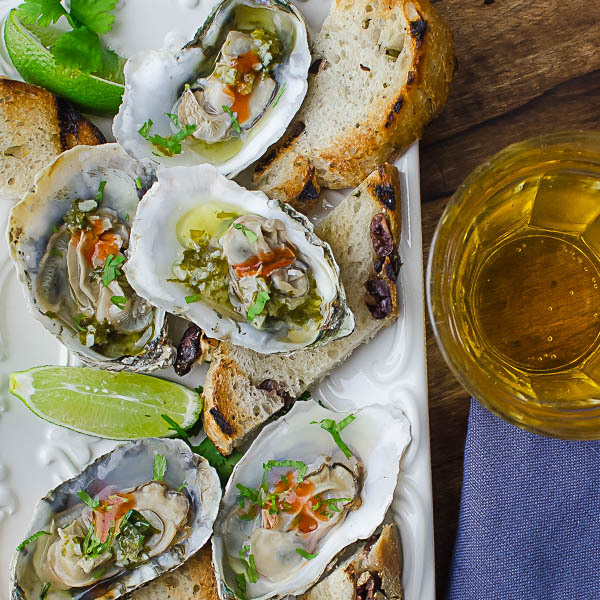 I’m sure hubby will be all over this recipe, he LOVES oysters. Wood grilled sounds fabulous! I want to try that! 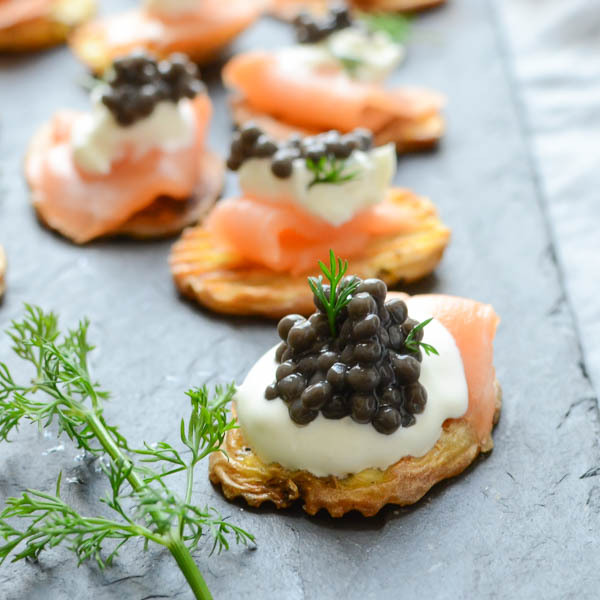 My daughter is an oyster person and I am a cooked seafood person, so I think this recipe is perfect for us! 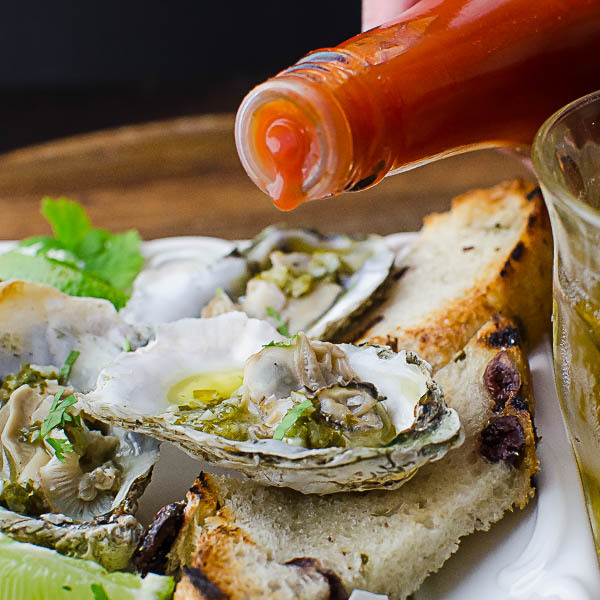 A little lime, a little hot sauce – they sound great. It’s a little chilly for grilling here right now though, so I’m wondering if the broiler would work. Fresh seafood is the best! 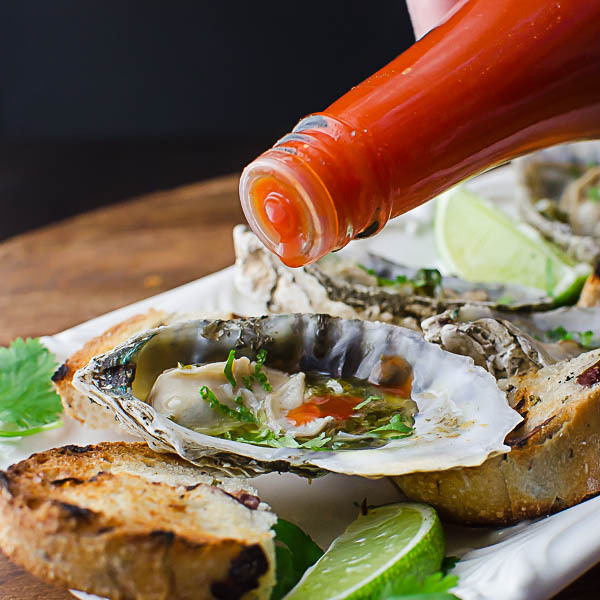 What a lovely gift and the oysters sound wonderful the way you prepared them (I’d just omit the cilantro-yes, I’m one of THOSE people) 😉 I love Crystal hot sauce, too! Happy New Year! That’s ok, I used to be one of THOSE people too! Happy New Year! That is an incredibly thoughtful gift. I grew up landlocked so oysters weren’t something I tried until I was an adult. I liked them well enough but they aren’t something I crave. You have managed to make them look so beautiful that I can’t wait to dig in! Thank you, Jamie — I appreciate that — and yes, this is a fabulous gift!